Were Car Radios Ever Illegal? Should They Be? These days, we can’t imagine driving even to the corner store without listening to either a channel on the AM/FM signal that comes through our car’s antenna or the bevy of satellite radio channels that are available. But car radios weren’t always such a luxury. In fact, when car radios first hit the scene in the 1920s, they weren’t only expensive, but they were somewhat of an inconvenience. Yes, the first car radios appeared in Chevrolet cars – and they were so big that they barely even fit into the car when you accounted for the size of their speakers, antennas and batteries. Despite their initial awkwardness, radio technology advanced over the next decade to where they became smaller and more easily integrated into vehicles for drive-time entertainment. Around the time radios became more widely accepted, however, they were also met with some ire. In fact, many legislators believed that car radios caused a distraction – so much so that legislation was introduced in many states to fine drivers listening to car radios. Specifically, in Minnesota and Missouri, legislation was introduced to completely ban car radios. Other states like New York, New Jersey, Ohio and Illinois introduced legislation that would fine drivers found to be operating while listening to their car radios. None of the legislation ever became law – but it wasn’t for the lack of vocal support for such bills. Much like how texting and driving and cell phone use is associated with an uptick in auto accidents, many at the time believed that car radios led to more accidents on the road. Those in support of car radios argued the opposite, and that listening to car radios kept drivers more engaged on the road. Those in support of car radios were eventually found to be correct in their belief, as no formal study ever connected listening to the radio in a car with an increase in auto accidents. Should Car Radios be Banned? There was no scientific data to suggest that car radios led to more auto accidents back in the 1930s when the issue was being seriously debated – and there’s no evidence to suggest that things have changed in the present day. Radio helps drivers learn of accidents and weather conditions while they’re on the road, helping them to better navigate routes and plan. Drivers can also catch up on the latest local, national and world headlines as they commute. The car radio has also led to a whole new entertainment industry. Radio stations these days are big business, and it is largely those that listen while they’re in the car that drive ratings, advertising dollars and success for said stations. Just because it’s worth mentioning again, radio also helps entertain drivers while they’re on the go. In their cars, they can listen to the baseball game, their favorite pop, rock or country stations, or their favorite news station. With the variety of radio stations available today – not to mention the options that satellite radio also provides – it’s hard for drivers to not be entertained while they’re on the go. 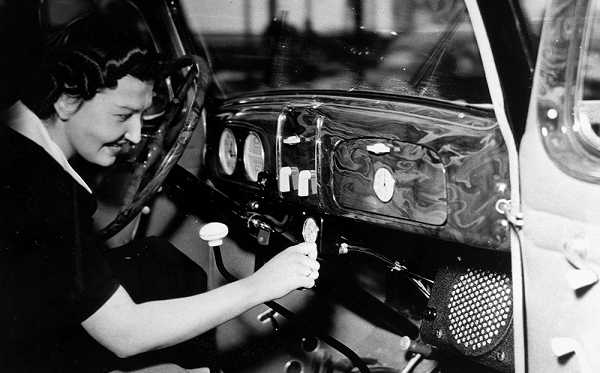 We take car radios for granted today, but they were once nearly outlawed in some states. Yes, they can be a distraction – but so can just about anything in the car if not treated responsibly. For more information on minimizing distraction while you’re behind the wheel, contact our defensive driving course today.